A stunning collaboration, over a hundred years in the making. Usually brand collaborations are reserved only for higher end designers and result in an even higher price tag. Luckily for those of us on a budget, Timex and Red Wing, the venerable watch and footwear brands both over 100 years old, have teamed up on a small collection of watches that look like they should cost much, much more. Offering 3 timepieces, a 38mm, 40mm, and 42mm chronograph shown here, the Waterbury Watch Collection offers vintage styling with the quality both brands are known for. 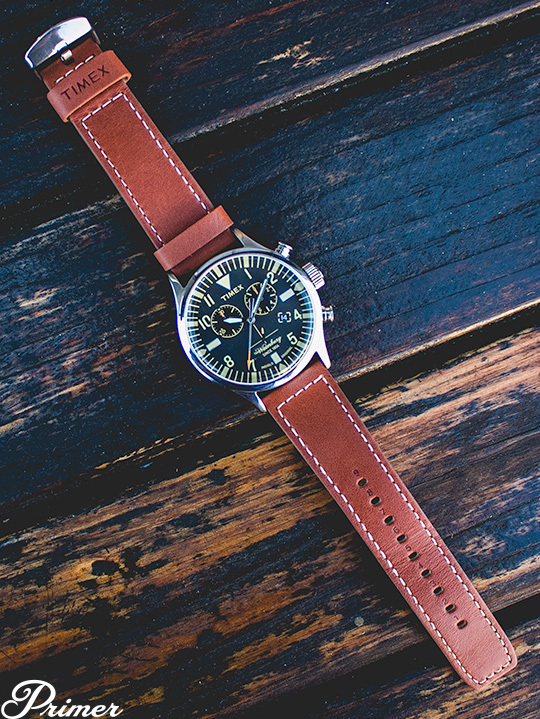 Timex's vintage styled timepiece with modern features like lume and Indiglo while Red Wing produced the rust colored straps from their quality boot leather. The best part? The 38 and 40mm watches are only $109, with the chronograph at $135. The collection originated in Timex's Tokyo Design Studio – Japan actually has had a long interest in Americana styling. Fashion designer Todd Snyder discovered the timepieces when working with Timex on his own collaboration. 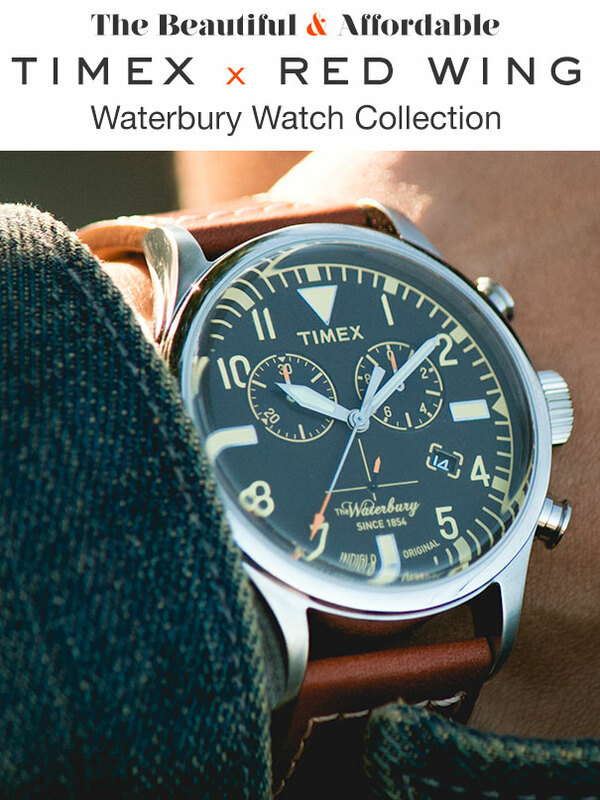 The Waterbury name is a nod to Timex's long heritage. The company was originally founded as The Waterbury Clock Company in 1854 in Waterbury, Connecticut. The region was home to so many clock manufacturers it was known as the “Switzerland of America,” with Waterbury Clock Company being one of the largest. Wars (and them ending), a saturated market, and new cheaper quartz entries from Asian companies caused the watch region to all but fade away, with WCC being one of the few survivors. Today, its successor Timex Group USA is the only watch manufacturer remaining in the region. UPDATE: Whew! Looks like you guys really dug these. They're sold out on End now, which I believe is the only retailer currently. I've reached out to Timex to find out if they're available anywhere. Stay tuned! UPDATE 2: Looks like Todd Snyder will sell them on their site starting March 1. 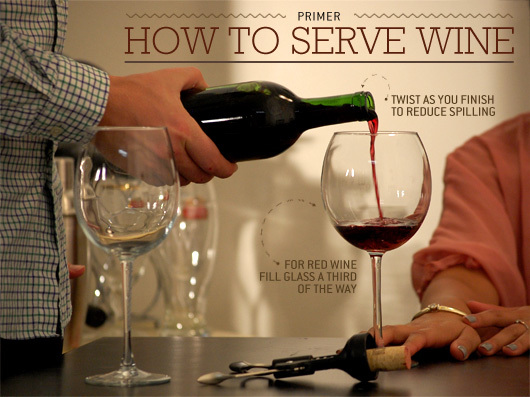 Thanks for the tip in the comments, Brian! Andrew, I love this watch and I’ve got a question — this watch has a brown band and a black face. Does it matter, or can I wear it, when I’m wearing a black belt with black shoes? Should I only wear it when I’m wearing brown shoes/a brown belt?? Andrew can also weigh in here, but you should match the color of the watch strap / band, not the face, to your shoes and belt. Since the band is brown you should wear it with brown shoes and a brown belt. The color of the belt, shoes, and watch don’t have to match exactly, and preferably wouldn’t, but you should stick within the brown color range and not wear this watch with black shoes or a black belt. I’ll add my input: I have the first version of this watch (without the second subdial at 6 o’clock) and it came with a black band. You can easily find a brown band (or black, to replace the brown on this one) on Amazon and swap it out with a cheap spring bar tool. Gives you a completely new look! Any idea where to find the 40mm or the 38mm? The link directs you to the 42mm option only. Any idea if the smaller options are still just available through Timex Japan? I like the domed crystal on that watch. Classic. If these become more widely available, and at the $135 mark, I’ll likely pick one up in the future. Great find! Seriously though, does anyone know if these will be available through anyone else? Or was this it? Andrew? I actually really want one to keep. From what I’ve been able to find, they supposed to only be available through Todd Snyder’s website. Though I can’t find any mention of them there. I hope you can find some positive info Andrew. Otherwise, such is life. Andrew, I just sent you a link via FB Messenger. Andrew, can I ask what model is the one shown above? I can’t seem to find that configuration with that dial face and the leather bands. Hey Saul, It’s the 42 mm chronograph, it looks like after a full day of Primer traffic they’re sold out now. 🙁 I’ve reached out to Timex to see if they can point me to any other retailers. Wow, shows how far your reach is. Impressive. And I appreciate that. Thanks Andrew. Great looking watch. I love that there is a renewed interest in classic brands like Timex and Red Wing. The only thing that worries me about this is the famous “Timex Tick”. Are these as loud as some other Timex models? Awesome Post. Love this watch, a true love child of two epic Brands! Love the look of the Timex casual watch line and am a HUGE Redwing Heritage Boot Collection fan. To merge two of my favorite brands to make an amazing product is a game changer!! Thanks for the heads up Andrew! Please let me know when they will be getting more of this piece in stock! And you save $40 to buy whatever strap you want. They constantly run sales too, so maybe even save a little off the top. Good looking watch. Horrible ‘brown’ strap. You already know that the Air Jordan 4 Premium is set to drop in a blacked-out edition replete with croc-style scales and faux pony hair this new balance 890 month. But that may not even be the most eye-popping colorway of the upgraded model.That title would belong to the Snakeskin edition, rumored for a summer launch. Like this months pair, this one looks to the animal kingdom for nike free 3 5.0 inspiration, but in an altogether different manner. Snakeskin-embossed leather covers much of the luxe upper, delivering a stunning designer look Cheap Blake Griffin Shoes thats only underscored by the studded metal accents and leather sockliner.Theres no release date on the books just yet for the Air Jordan 4 Premium Snakeskin, so make do with a few new photos and stay tuned for developments. The black AJ4 Premium releases March 26.With the official release slated for this Friday, December 19th, we provide you more images of the Paul George Shoes bright and bold Nike Kobe 9 KRM EXT “Challenge Red.”Basketball is one of the biggest international sports in the world. France is one of the biggest basketball countries that has produced great NBA players such as Tony Parker nike air huarache run and Nicolas Batum. This weekend the country will host an All-Star weekend in Paris consisting of the best French players that includes a Dunk Contest and NIKEiD Skills Challenge.The Nike Kobe 9 Elite “What The Kobe” is a curry 2 floor general colorful sneaker with the perfect amount of everything. The sneaker is made up of a white base with a multicolored medley on the flyknit upper, inner lining, ankle, and tongue. The loud design is finished off with kobe x for sale reflective tonal graphics on the ankle, black panels, and a speckled white sole. Hitting select Nike retailers January 11th, let us know which “What The” sneaker has been your favorite so far!Just less than a week away Cheap Kobe 9 Elite High till its official debut, a gallery of detailed images featuring the upcoming Nike Kobe 9 Elite “BHM” is showcased, to better understand and appreciate the silhouette’s intricate design. If anyone is still looking to get one of these, they just went up on END and Todd Snyder again!